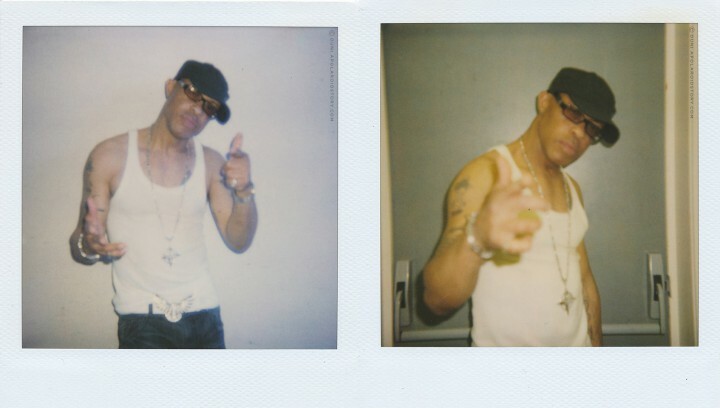 A Polaroid Story » Gifted Unlimited Rhymes Universal. I snapped Keith Elam, better known as GURU’s JAZZMATAZZ in a little city by the sea called Ostend, almost a year ago. Ostend, from all places I hear you ask? Yes. Ostende, ma belle. Ostend is a small coast city in Belgium and the place I love to wake up in the most. Do not underestimate the luxury of having an endless horizon to look at. It’s priceless and one of the many reasons I still live here. Marvin Gaye lived here for 2 years, to kick off drugs and to find his inner self again. He went to church in Ostend, worked out in the local boxing gym, went to the local bars, made long walks by the beach, talked to fishermen, played the piano in the local Casino from time to time and wrote Sexual Healing before he left Ostend, and went back to the States for his comeback and final chapter of his life. There is something about Ostend. It attracts people you never think they would ever end up here. So, one year ago, Ostend City organised a local little festival in the towns local Casino for Ostend’s youth. That’s how GURU’S JAZZMATAZZ feat. SOLAR and THE 7 GRAND PLAYERS ended up playing a gig in the Casino of Ostend. I know that a lot of people initially know the MC/lyricist Guru from the group he started out around 1989 called GANG STARR with DJ PREMIER on his side. Gang Starr made a huge mark on hiphop in the 90’s but for many different reasons, after 6 albums, Gang Starr was history. Guru and Primo went their separate ways and Guru started out with GURU’S JAZZMATAZZ. If I look back, the 3 first songs I associate Guru with are not from his Gang Starr period. That might seem strange for some of my internationals, but it is simply the truth. Guru first got stuck on me, on a warm sunny day, hanging on a parking lot by the sea in a white van with a huge black gorilla stencilled on it, smoking a doobie and looking to that endless horizon Ostend provides you for free. This song hit me like lightning, because I never thought about the fact that it is possible that one day you might not love somebody no more. And yes. I was feeling Craig David at that period. His voice felt like honey to me. What can I say…. This KELIS track produced by The Neptunes. The last song is the song LE BIEN, LE MAL one, because I really réally liked the fact that MC SOLAAR was on it, and the combination of English and French seemed effortless. ‘The Good, The Bad’ eventually led me to JAZZMATAZZ Volume 1° and it was only later I discovered Gang Starr. Strange how one’s musical discovery can differ from someone else’s, right? If I recall correctly, Guru’s Jazzmatazz performed at the Delvaux room in the Casino and when I entered I was happy to see the place was nicely crowded. Ostend is a strange and lonesome place and I wondered if there would be enough people to fill the room up. Cool to see what kind of people came to watch Guru, a mix of young and old, a very versatile audience basically. For some reason, I don’t really have any specific memories about the performance, so I can’t really go any deeper into that. All my memories come from the moments after he performed. After the concert Guru reached out to the audience to come for a picture and buy one of his albums if people liked to. Nowadays most artists let other people handle their concert goodies and CD’s but Guru did it himself. I remember having mixed emotions about that for some strange reason. Jules and I walked straight up to him while he was doing his thing. We shook hands, and I explained this little blog. He agreed on taking a picture but asked me to wait a little bit more so he could finish the after concert stuff. So me and Jules waited on the side, watching how Guru posed with fans for a picture, selling an album here and there and signing some pictures and albums. When he was done, we followed him to a backstage hallway close to the stage and I asked him what I ask everyone, to give me -if possible- 2 different poses or expressions. After the first picture I realised I just used my last film and that I will have to feed my baby some new snaps which means more time… It’s never good to snap an artist with the last picture because if they are impatient or they suddenly have to go somewhere you only have 1 picture you can rely on. If that picture is not good, well… you’re fucked. It was not the first time changing a Polaroid cassette, cost me a good instant Polaroid moment. Jules immediately started to rip of the carton of my new Polaroid film package and I apologised for the delay, because the 5 minutes I asked for quickly turned in to a couple of minutes more. He looked at us, smiled and said: “Looks like you are a pretty good team together, she got your back.” I watched Jules, feverishly ripping that carton from the package and handing me over the new film. He was right. She does. Turned out the blacklight in the hallway was making my picture cold, blue and very unsharp for some strange reason so I proposed to go elsewhere with a different light setting. He agreed and gave me a final pose. I took 3 pictures in total and gave him one, as a little Ostend souvenir. He told me that was very kind, but not necessary, since he had tons of Polaroid pictures at home, but took the picture anyway. I thanked him, and while we were waiting for the Polaroid pictures to come through, I told him it was nice of him to be so patient and nice, since we had some very recent other experiences with artists and it was a relief for us to have someone acting normal for a change. He smiled and said: “I stopped being arrogant a long time ago. The industry taught me to be humble.” We talked a little more and he gave me his email address while saying: “You do realise if you spread this around, I will come for you.” and laughed. I promised to send him an email, once I post his story online. We said our goodbyes and although he asked to come back later to hang out a little bit, we never saw him again. Until a couple of days ago Guru became headline news. Around March 1 2010, different media stated that Guru had suffered a heart attack and was in a coma because of that. For a couple of days his health was on the line and things looked like there was a slight chance that Guru might not survive. Twitter was packed with #guru topics, about his health, his career and his current relationship with different individuals in the industry. I felt it very hard to filter all the information into what really was going on and what was just straight gossip. And then I realised I still didn’t post his Polaroid picture, almost a year after I took it…. The main reason for this, was the fact that I wanted to post this one together with a Polaroid from DJ Premier that was booked a short period later in Belgium. The current information about Guru and his health is very mixed, but I thìnk statements that he is finally recovering are correct. Let’s not focus on all the negative that surrounds this person. I mean, what do we réally know about his current situation with producer Solar, his relationship with DJ Premier or his family? Let’s focus on the positive news that a pioneer in music is still amongst us and leave all the gossip behind. Truth will come out eventually.